The NEC is administered by the National Fire Protection Association (NFPA) and is revised every three years. The 2005 NEC has recently been released for publication and is currently available from the NFPA at www.nfpa.org. What changed in the NEC?  Be enclosed to provide a containment barrier.  Use a special lampholder that will only accept an ANSI Type O rated metal halide lamp. When did the 2005 NEC take effect? January 1, 2005, but adoption of the it varies from state to state. Based on adoption of the 2002 NEC changes, several states could adopt the 2005 code immediately with approximately half the states adopting in the first year. How will this change affect Venture? Venture Lighting fully supports the NEC changes. They simplify the metal halide systems options available and will also reduce the potential risks associated with failure when properly following the warnings and instructions for systems that specify open luminaires with Type S lamps. All lamps produced by Venture Lighting meet or exceed the requirements to receive an O rating, and can be used with confidence to meet the new requirements of the NEC. Venture Lighting provides the industry's widest selection of lamps that meet or exceed ANSI C78.387 testing requirements for a Type O rating. What is the ANSI test? The ANSI containment test was developed by the ANSI Standards Committee C78 to determine if a lamp can be rated for open luminaire operation. In the ANSI C78.387 test, arc tubes are forcibly ruptured to test the integrity of the lamp, i.e. to determine if the design can be containment-rated. In order to receive the "O" rating, the outer bulb cannot be cracked or broken. What is the difference between "S" and "O" rated lamps? E - Lamps must be used in enclosed luminaires which meet the requirements of UL1598. 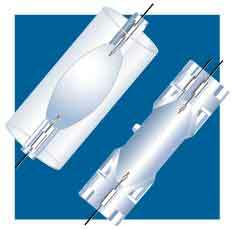 S - Lamps are considered "suitable" for open luminaire operation, only if operated in the vertical ±15° position. Lamps do not meet ANSI criteria for containment and must be turned off at least once per week for a minimum of 15 minutes if operated continuously. In addition these lamps must be group relamped before reaching rated lamp life. O-Lamps can be operated in open or enclosed luminaires within the manufacturer's specified operating position limits. This type meets the ANSI criteria for containment rated operation. Special exclusionary sockets are available for these lamps to ensure that the wrong lamp type is not used. What is Venture's Policy about "S" rated lamps? Venture Lighting does not participate in the practice of designating any of their lamps with the "S" rating. Moreover, Venture offers a broad selection of shrouded, open-rated lamps in its standard (probe start), White-Lux®, Energy Master® and Uni-Form® pulse start product lines. These Venture "O" rated lamps do not need to be cycled in 24/7 operation.